Rick hallucinates seeing himself in the hospital bed from the very first episode. 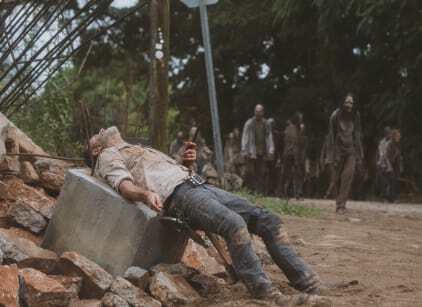 Rick regains consciousness and finds himself impaled on the rebar with the walker herds quickly approaching. In a split second decision, Rick uses his belt as a pulley system to lift himself off the rebar. Rick gets back on his horse and continues to lead the herd away. Anne radios to the helicopter and lies, saying that she has an "A" person so that she can get picked up. Maggie arrives at Alexandria to kill Negan and is confronted by Michonne. Undeterred, Maggie convinces Michonne would think differently if it were Rick that was killed instead of Glenn. Michonne reluctantly allows Maggie to enter. Maggie unlocks Negan's cell as he taunts her. However, Maggie hesitates and Negan quickly becomes distraught and begs for death so that he can be with his wife, Lucille. In his broken state, Maggie realizes that his current situation is a fate worse than death, and decides to allow him to live in prison for the rest of his life. Rick has a series of hallucinations as he falls in and out of consciousness which includes conversations with long dead friends including Shane, Hershel, and Sasha. The interactions represent Rick's subconscious and his will to keep fighting every time he thinks about giving up. At one point, Rick falls from his horse and is forced to continue onward on foot while he continues to bleed out. Rick is able to lead the herd to the bridge in hopes of it collapsing but is surprised to find that the bridge will, in fact, hold. Daryl and the rest of the communities arrive just in time to save Rick from being killed by walkers and attempt to distract the herd. However, Rick notices dynamite that had been knocked over by a walker and shoots it to protect his friends. The bridge is destroyed in the explosion, killing the herd and supposedly Rick in the process. Further down the river, a helicopter is about to touch down to pick up Anne as she comes across Rick, injured, but still alive. Anne radios to the helicopter that she has a "B" person so that they can save him, to which they reply that there will be consequences for Anne lying. The chopper takes Anne and Rick away as she tells him that he's going to be okay. Sometime later, an unknown group of survivors is saved from walkers by a now 10-year-old Judith Grimes, revealing that a huge time jump has taken place.